The snare is one of the most important components in your drum kit. Perhaps more so than with any other drum, it can change the overall sound of your kit. As you’re about to see, there are many types to choose from. In this article, we’ll guide you through the best snare drums on the market for your style of music. 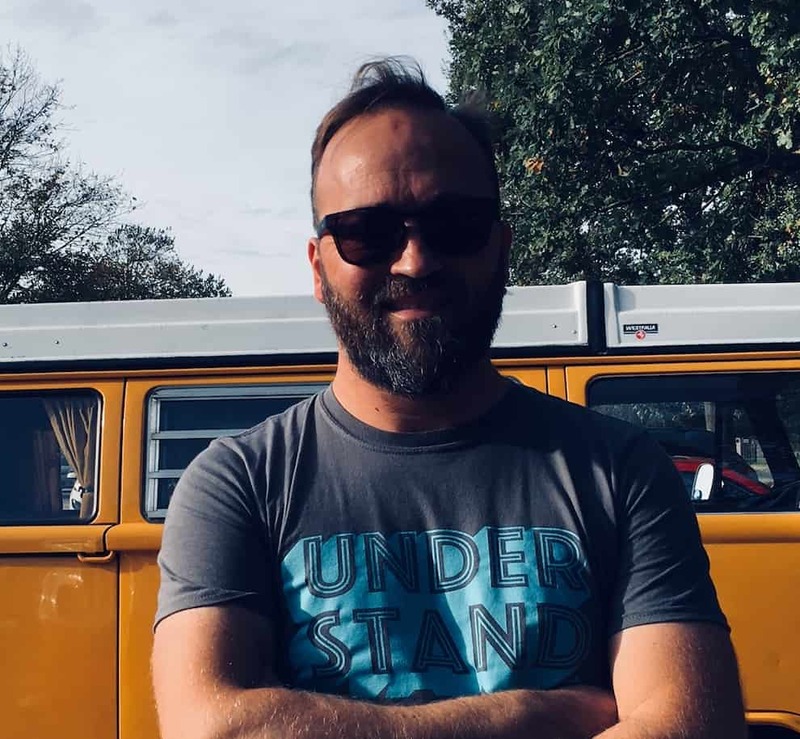 If you’re in a hurry, here’s a quick peek of what we’ll review in this article. Which is Best for Jazz? Which is Best for Metal and Rock? So what are the key considerations when looking to buy one? Drums are made from a variety of materials: copper, brass, nickel over brass, bronze, birch, maple, aluminum and even acrylic. As metals go, steel is a very hard, rigid metal that has no tonal quality. Brass, on the other hand, does have natural tonal quality (if you were to hit a bare steel drum with a stick it wouldn’t ring, whereas a brass shell would). The good thing about steel though is it makes for great attack – and because it doesn’t flex and absorb sound, it makes the drum heads vibrate like crazy. Another good thing about steel is you don’t need to worry about warping – unlike a wood snare, where excessive heat or cold could cause it to expand or shrink. The thickness of the drum shell has a direct effect on the sound. Thinner shells are generally warmer, more sensitive with greater resonance than thick shells. They also have more low-end but aren’t as loud. Thicker shells, on the other hand, have more mid-range tones, project more volume and have greater attack. It’s worth noting that plenty of people swap and change snares according to the song or sound they’re going for. The snare has an entirely different purpose than the toms, so there’s no reason the drum thickness should match. One of the best drummers to ever live, Steve Gadd, uses three different ones (birch, maple, and steel) and mixes and matches to suit what he’s playing. Like all drum shells, snares come in different sizes, usually measured in inches. Larger ones are more common in drum sets geared towards rock, metal, and other hard genres, whereas smaller snares are more a feature of jazz and fusion sets, and have a tighter sound (with more emphasis on higher frequencies). Of course, there are no concrete rules. The weight of the shell can also make a direct impact on the sound. For jazz sets in general, wood tends to be the material of choice, and of all the woods, it’s maple that’s the most popular. Maple, with its warm tones, is the all-around workhorse for jazz but often even warmer woods are preferred (cherry, walnut, even mahogany). Steering clear of brass or tough woods is usually a good idea for jazz. All the considerations we’ve already discussed applied too, i.e., rigidity, thickness, size, and weight. Go with a conventional size too, from 5×14 to 6.5×14. Getting the right sound for jazz is as much about drum heads, tuning, and your touch on the instrument as it is the shell material. Regarding adjustment, for jazz, it’s good to get the head tension just right s o you get a lot of response without too much crack and pop. It’s good to leave a bit of dirt’ or ‘warmth’ in the sound. You want a nice ‘papery’ sound that’s tight enough to give you adequate rebound for the quick ghost work done in Jazz. It’s also important to take into account the sound of your cymbals, as you’ll be wanting a snare that blends in with your ride cymbal. As wood is used in jazz, so is brass or bronze the preferred poison for metal and often rock. Deep brass snares give you a booming loudness that metal players crave, along with a ‘ping’ tone. 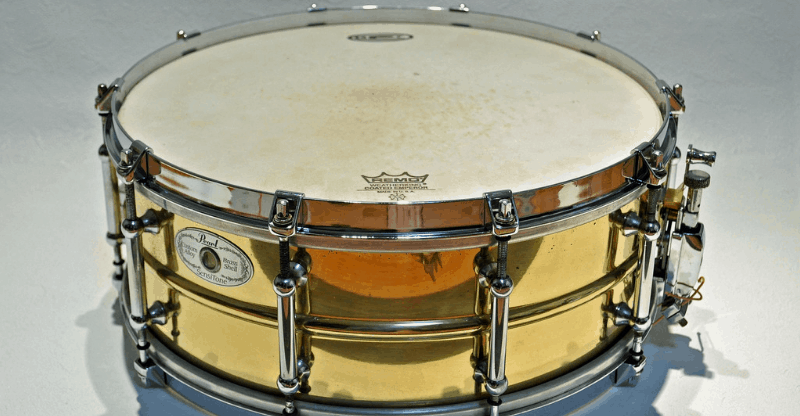 Thanks to its versatility, the Ludwig Supraphonic (see review below) is often the weapon of choice for metal. For the money, there’s probably no better-sounding drum. We start our list with a humdinger; the Dennis Chambers signature snare by Pearl. Unless you’ve lived under a rock for the past 30 years, you’ll know about Dennis Chambers. He’s played with a star-studded list of jazz and funk legends from John McLoughlin to Herbie Hancock, not to mention his stint between 1975-1985 as Parliament and Funkadelic’s resident drummer. 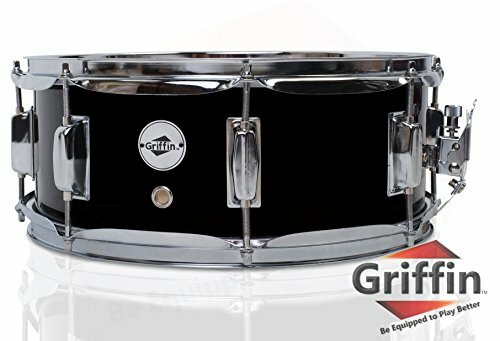 With excellent sounds and tonal dynamics, this black nickel plated drum comes in a cast aluminum shell with 5mm reinforcement walls. It features ribbed-like grooves around the outer shell to denote the grooves of a record (nice touch). The relatively large scallops taken from the bottom ridge make sure a large snare bed. The price isn’t for the short of cash, but if you’re looking for a premium snare, you can’t go wrong with this number. 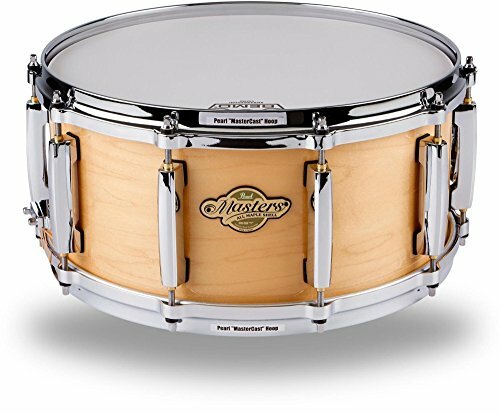 If you’re ready to try out a top of the range, premium snare, then this is the one to go for. Only for the most serious of musicians, it’s been a staple of recording studios and big-name artists. A slightly more affordable option than the Ludwig Supraphonic, this is capable of competing in terms of quality and has a maple construction with die-cast hoops that give it an excellent sound. The 12-ply, 10mm Bubinga shell makes this product stand out immediately, and it sounds phenomenal. The hardware is cleverly designed to make it easy to tune and replace heads. 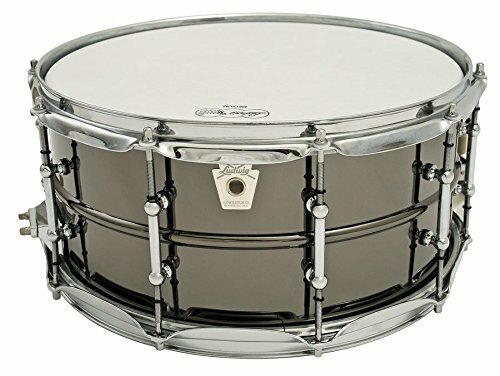 So far we’ve looked at some mid and high-end snares so we wanted to round out the list by including a budget-friendly option that still performs better than many that comes with an entry-level set. The ultimate decision when choosing the right one will depend on whether you want a warmer wood-based shell that’s suited to jazz or a metal (bronze, brass, etc.) drum that’s better for metal and rock. 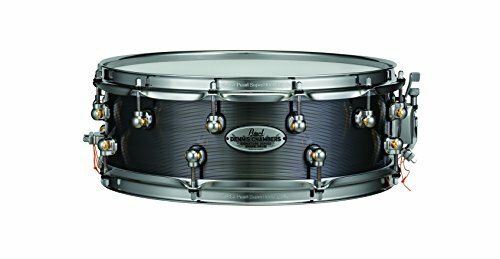 You get what you pay for, and you’ll find the two premium drums on our list (the Pearl Dennis Chambers Signature Snare and Ludwig Supraphonic Black Beauty) are a superior build with better dynamic range and tuning capabilities. But they are on the pricey side. If you can afford it, you won’t regret it though. 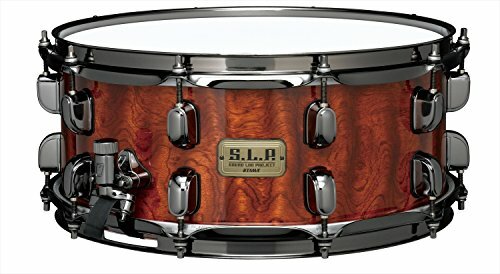 For a cheaper alternative that doesn’t sacrifice too much on quality, the TAMA SLP Bubinga will be an excellent choice, especially if you want a dry tone.